Club President Elect Tracy Shaffer called the meeting to order and made welcoming remarks for the Rotary Club of Ellsworth’s Paul Harris Fellow Recognition night held at ig Cat’s Event Center. Tracy provided our invocation and we said the Pledge of Allegiance. 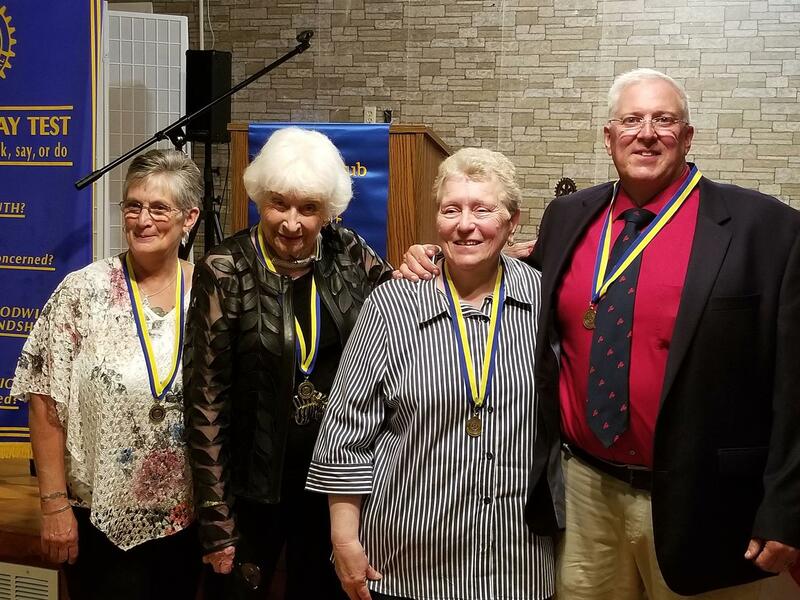 Secretary Charlene Churchill introduced the thirteen Club Past Presidents who were in attendance and our District Governor Lincoln Ehrlenbach and Area Governor David Wells. All the current Fellows who were in there stood and were recognized. “It is an honor to present a Paul Harris Fellow to a person who has dedicated 37 years to public education. For the past 29 years, Mr. Newett has served as principal of Ellsworth Middle School and he has been a tireless advocate for students and teachers. Those that know Mr. Newett understand his commitment and dedication, which has included working year round, putting in six and sometimes seven-day work weeks and nights. His skill and effort has truly made a difference. When our Club recognizes a community member as a Paul Harris Fellow, we look carefully to select those who live their life by the Rotary 4-Way Test – this being: Of the things we think, say or do: 1. Is it the TRUTH? 2. Is it FAIR to all concerned? 3. Will it build GOODWILL and BETTER FRIENDSHIPS? 4. Will it be BENEFICIAL to all concerned? Mr. Newett embodies all of these aspirations. And thousands of students who have been educated in our community have benefited from the examples he has set, guided by respect and love. Mr. Newett had to leave for his last School Board meeting. We enjoyed a nice buffet dinner and then re-convened our presentations which started with Past President Carl Lusby providing an overview of the Rotary Foundation’s beginnings and the history of Paul Harris Fellow recognition. “Dotty is a graduate of Sumner Memorial High School Class of 1974, where she gave the address to the graduating class of 2018 last Friday. After working for a number of years as a Pharmacy Aide for LaVerdiere’s Drug in Ellsworth she applied for a position as a Dispatcher for Ellsworth Police Department and was hired. A few years later, Police Chief Albert Carter urged her to apply for an opening they had for a Patrolperson. She did so and was hired. Shortly after that she attended the Maine Criminal Justice Academy for Municipal Officer training, coming home only on weekends to be with her family, especially her 2-year-old daughter Kayla. On Sundays she would drive back to Waterville for the upcoming week’s classes. It was the dead of winter and snowed every weekend. After graduation from the Academy she started a long career which has accumulated many accolades, from Ellsworth Officer of the Year a number of times, a recognition by her peers, from the press, and most important to her, the public which she truly loves dealing with. She was a DARE officer and helped shape many a fifth grader in the Ellsworth School System who to this day have faith in confiding in Dotty now as adults because they know she will listen to them. She was the first full time female officer for EPD. She was on the first Sexual Assault Forensic Interviewing team in the State of Maine and went on to help set up other such teams across the state. She has taught at the Criminal Justice Academy and she has been a key speaker for the Maine Municipal Association at their conventions. Dotty also took the Maine EMT course and received her Emergency Medical Technician license from Maine EMS to be able to help others and to also get a better understanding of the science and treatment of patients. She started the Ellsworth Police Department’s Facebook page which has been a model for many across the country. The page has led to the solving of many crimes and is an excellent source of tips for other investigations. 24/7 for 37 years is what she has put into the Police Department. She fields calls and text messages from fellow officers and the public constantly; always responding even to what to others would be trivial questions and complaints. Micki graduated from High school, Immaculate H.S., Leavenworth in 1970 and received her BS in Psychology in 1974 from Marymount College, Salina, KS. She worked hard and multiplied members many times to 625– where it has mostly remained. Programs she introduced during her tenure include Leadership Hancock County, Made in Maine Trade show, the True Health Wellness Program. All the Chamber events have her name on them. “Born in Machias, this lady’s family moved to Ellsworth after the Ellsworth fire when her father was offered a job with the Telephone company. Educated in the Ellsworth schools, she married, raised two daughters, enjoyed playing bridge, golf and tennis, traveled extensively but felt something was missing. Her words, she was “bored silly”. At 45 she decided to run for public office. She was elected to the Ellsworth City Council, serving two terms and was the mayor. No longer was she bored. She discovered that she like public service and that she enjoyed her experience with the City. She then decided to run for the House of Representatives. She served 5 terms in the House, sitting on the Appropriations Committee and then two terms in the Maine Senate. She was named Legislator of the year in 1988. She worked closely with Senator Susan Collins on the Worker Compensation Law. She was founder of the Maine State Cultural Council. When not in session, she was keeping her constituents, informed of bills brought to the legislature that she felt might affect or have an impact in their respective areas. She actually spoke at Rotary, presenting on the State budget. She felt her presentation was not being listened to as closely as she liked, so she started reciting her favorite poem from high school, Barbara Frietchie, written by Whittier. Well the Rotarians loved it! Giving her a roaring round of applause. As you can see, this lady has a great sense of humor. It was when she was in the Legislature that I first met her. I was in public accounting and she would bring in her “State” documents for tax preparation. If you think your tax information is complicated, try deciphering the State paperwork. She always was smiling, talkative and happy. She’d sit across my desk and say where do I sign and tell me how much I owe. She was the only client who didn’t argue or complain. When we spoke about this last week, she stated that her philosophy was to not micro-manage and let people do their thing. She simply trusts people to do their job. She has always treated me with kindness and respect. It was during her term as Senator when she purchased Adam’s department store on Main Street in Ellsworth. She did not want to see the store be closed and turned into office space feeling very strong about keeping retail stores on Main Street. She liquidated the merchandise and made the store her own. Ruth Fosters has been in business for 34 years, surviving picketers and recessions, and still doing well. I know most all of us have shopped there. With all her responsibilities with family and the legislature, she still found time for volunteering. Many organizations have benefited from her time and expertise. She has opened her home on numerous occasions to help raise awareness and money for various causes and to welcome new people in our community. She has served as a trustee for MCMH, and is an honorary trustee, she was President of Birds Acre and President of Woodlawn. She currently is on the Community Council and Foundation Council for MCMH. Can you believe this lady was never asked to join Rotary! I was shocked when she told me this. Ruth exemplifies Rotary’s Moto, Service Above Self. 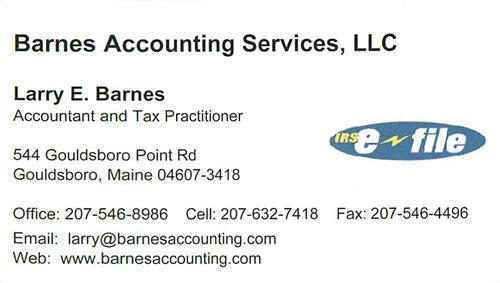 Serving her family, her community and the State of Maine. She shared with me the reason she loved the poem Barbara Frietchie. “It’s about a feisty woman”, she said. I went home and read the poem, I now understand why Ruth relates to the poem. Barbara, like Ruth is unafraid to stand up for what she believes in. At this Rotary meeting, in Ruth’s honor I would like to recite her favorite poem. “How many of you would greet a stranger? How many would drum up a conversation with someone you had never met? How many of you have been running errands, seeing someone in need and stopped to help? This Rotarian did all of these just last week. The Rotarian I know stopped at Friends and Family Market in Ellsworth Falls last Thursday to do some shopping. After completing his task, he came across an older lady, who looked like she needed some help. After the fixing the lady’s bike rack which was falling off her class C motor home. The lady asked for directions to Timberland Acres RV Park. The Rotarian not only gave the directions, but also offered to show her the way. He offered to have her follow him to the park. He came into the office all smiles and I asked him, what are you doing? He told me that he had this lady follow him to the park. I asked, is she related to you? He answered no I just met her and told me the story. It’s acts of kindness, like this that this Rotarian does each and every day. When not helping older ladies at the grocery store you can find this Rotarian, donating trucks and storage space, contributing to any rotary cause, volunteering at pancake breakfasts, volunteering for the city of Ellsworth or the Town of Trenton. Mark Remick has served the public in many capacities. He has been a police officer in Michigan and Maine, serving as a detective, patrolman and drug agent. He served 4 years for the USAF Air National Guard as a police officer. Mark has also worked with adolescents in a residential treatment facility and completed a double major undergrad program from Springfield College. He has worked for theMDI/Ellsworth Housing Authority, Ellsworth fire Department as a volunteer fire fighter. As a volunteer fireman, he served as President of the Senator Hale Hose Company. In the Town of Trenton, he has served as vice chair of the board of selectman and chairman of the Trenton Planning Board. Mark has volunteered for many service organizations to include the City of Ellsworth 250 Committee, serving as co-chair, he has served as President of Remick Cemetery Association, President of The Oak Point Association, President of The Rotary Club of Ellsworth and Assistant District Governor 7790, and Chairman of the Ellsworth Harbor Commission. Mark has been Master of the Ellsworth Masonic Lodge and served in many capacities for the Congregational Church of Ellsworth. Closing remarks were made by Club President Elect Tracy Shaffer, followed by adjournment and pictures of the new Paul Harris Fellows and all the Fellows who were present.